But you will learn a lot more about the legendary Jewish-American composer’s history and accomplishments after a visit to “Leonard Bernstein: The Power of Music,” the latest exhibit at the National Museum of American Jewish History (NMAJH). Ivy Weingram, is the curator — or more appropriately, conductor — of the impressive exhibit, which is in tribute to Bernstein’s hundredth anniversary. Worldwide, countless events have taken place, and will continue to occur throughout 2018, to celebrate the deceased music icon. Philadelphia has already had its fair share of events honoring Bernstein, including “Lenny’s Revolution,” a concert conducted by Bernstein’s protégée, David Charles Abell, and the Philly POPS orchestra. Beginning when we are children, we all take pledges. The earliest pledge for most of us is when we pledge allegiance to the flag. Most of us earnestly do this before we know what “pledge” or “allegiance” mean. All I knew was that it involved “the Republic for which it stands” which I assumed was all one word (“Forwhichistan”) and was probably near some of the smaller, similarly named countries in Soviet Siberia. As I grew older I learned there are other pledges people take, almost all of which are bad ideas. For example, some people take a “Pledge of Chastity,” which, if the statistics are any indication, is tantamount to a pledge to get pregnant, immediately. Then there are the loyalty pledges we made people sign during our dark, McCarthy period (I refer to Senator Joseph McCarthy, not Charlie McCarthy, the ventriloquist’s dummy, whose view of anti-communist purges is more ambiguous). Turns out, that people who are disloyal, have absolutely no problem signing loyalty pledges. Go Figure. I remember taking the Boy Scout pledge. I don’t remember all of it, but part of it was me swearing to be “brave, clean and reverent.” But as a 15 year old, I was a scrungy, blasphemous coward, so clearly that pledge needed some tweaking. Then there was the “Pledge Pin” where a young man would insert his fraternity pin directly into the pectoral muscles of his best gal. At least that’s what I did. Maybe that’s why I never got second dates. And then some pledge their “troth,” and who the hell knows what a “troth” is? I __________, am of reasonable intelligence. This means I am not as dumb as a ________, nor is my name _____W. ___. I hereby pledge, when driving on the streets of Pennsylvania, that I verily, and with utmost rectitude, will never, under any circumstances, make a “right turn,” or “right hand turn” as people who need extra help call it. I shall refrain from turning right even if I am driving straight and my destination is on the right. Or, if I am heading towards a brick wall and my breaks fail, and there’s a huge cliff on the left. Or, lets say I see a big sign that says “Lots of Money ahead, on right!! !” Nope not even then. This is a pledge written by a man named Grover Norquist, who has, to my knowledge, never even been to Pennsylvania (he may have taken a pledge not to), but who nonetheless appears to be running the state. Mr. Norquist’s pledge requires the signer to never, ever vote to create a new tax or increase an existing one. It does not matter how low the existing tax rate is, what kind of tax would be raised, what it would go for, how dire the state’s fiscal situation is or how tiny the increase would be. So even if the rapture did happen on May 21 (and I’m quite sure the guy is right about the new date) and we needed a small tax on… say… cigars to help deal with all of the unexpected rivers of molten lava and swarms of locusts, that would be unacceptable to Grover. This pledge applies under absolutely all circumstances. If it only applied when it made sense, you wouldn’t need a pledge. That would be a no-brainer and not require the services of Mr. Norquist. Recently, some in the legislature suggested that we charge the Marcellus Shale drilling industry a “local impact fee” to help defray the costs of the damage they do to the communities where they drill. The supporters of this proposal made it very clear that this was not a “tax.” It was a “fee.” You can tell because “tax” and “fee” aren’t even spelled the same. Plus, the money raised would not go to educating kids or giving medicine to sick people, or any other part of the radical, Kenyan Socialist agenda. Surely, Grover Norquist would smile on this. But alas unicorns, it was not to be. Grover, communing with the Spirit of Jack Kemp, as well as the spirits of the Koch Brothers, who while not actually dead, are too rich to require physical bodies, issued his edict. This fee was really a tax, and would be a violation of The Pledge. So apparently, because the Governor signed this ridiculous pledge to ignore all facts forever, our hands are tied. Grover Norquist rules the day, despite the fact that this does great damage to our state, despite the fact that he was never elected to anything in Pennsylvania, and despite the fact that his name is Grover. Done. Now I’m off to put my troth on EBay. Stealing PA’s Electoral Votes: Have you no sense of decency? In America, we don’t elect our presidents directly. 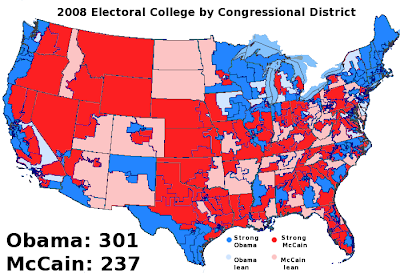 Each state elects representatives to the “electoral college”, which technically “elects” our president. For the past 224 years, since the first time we elected George Washington President, Pennsylvania has joined virtually every other state in casting all of its electoral votes for the presidential candidate who won the state’s popular vote. This has always made Pennsylvania a critical state in national elections because of the number of electoral votes we deliver. On September 12, Governor Corbett endorsed changing our system and instead awarding one electoral vote to a presidential candidate for each congressional district they win. It is important to be clear. This is an obscene, transparent, blatantly partisan change in the rules, designed for one purpose only; to help Republican Presidential candidates. Republican leaders are distressed that their candidates have lost Pennsylvania in the past five elections, and they wish to correct this problem, not by fielding better candidates or making more compelling arguments, but by stacking the deck to ensure their nominees receive the majority of Pennsylvania’s electoral votes, regardless of how the people of our state actually vote. We should be extremely suspicious anytime one political party unilaterally tries to directly affect the outcome of future elections. In this case, the Republicans in Harrisburg want to award electoral votes according to congressional districts. And who is drawing those congressional districts? Harrisburg Republicans! They control the congressional redistricting process completely. So they will essentially be deciding ahead of time just how many votes to guarantee future Republican presidential candidates. In fact, the congressional redistricting now occurring is likely to create 12 solidly Republican districts and 6 Democratic ones. This assures any Republican presidential candidate a clear majority of the state’s electoral votes. This means that your vote in the presidential election will be meaningless. Not only will our votes as individuals be rendered useless, this plan will also end Pennsylvania’s status as a battleground state and will make us completely irrelevant to presidential campaigns. Why should candidates come here when we will know in advance what the final electoral vote count will be? Presidential candidates will spend far more of their time in states where electoral votes will actually be in play. It is extremely strange and distressing that our governor is pushing a plan that would make Pennsylvania matter less in national politics. Notice that Republicans who control states that Republican presidential candidates usually win show absolutely no interest in changing their rules. We won’t be seeing this proposal moving in Texas or Mississippi. It is only states that Republicans currently control, but which tend to vote Democratic in national elections which will see the rules of their elections altered. Any change to our electoral college should be adopted uniformly across the nation, with buy-in from both red and blue states so there is no effort to rig future elections. The Governor gives lip service to improving our electoral system. However, this bill has nothing to do with good government. It is simply a partisan power-grab. If Governor Corbett was really interested in improving Pennsylvania’s electoral structure, he would support bi-partisan proposals such as early voting, no-excuse absentee voting or a national popular vote. But he opposes all of these. Instead, the governor supports this bill, as well as additional legislation which will make it harder for people who disproportionately do not vote Republican to vote at all, such as requiring photo ID every time someone goes to the polls. This will disenfranchise millions of the poor, the elderly, and those who live in cities. In the past, there were times when Democrats have controlled the whole process. They could have passed anything they wished, and when it comes to substantive policy, they often did. But nobody ever attempted to abuse their temporary control to fix future elections. As the prime sponsor of redistricting reform, I find it particularly disheartening that this proposal will make gerrymandering an even more entrenched part of the system. This is extremely disappointing coming from a governor who ran on a promise to reform our political system.